Acupuncture, a traditional Chinese Medicine technique in which very fine needles are inserted into the skin at specially designated points, has been used for thousands of years, along with herbal medicine, for pain relief and treatment of various ailments. It has been combines with moxabustion, the burning of moxa leaves from the Chinese wormwood tree for the treatment of hay fever, headaches, ulcers, arthritis, and hypertension. 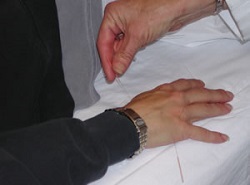 Generally, acupuncture needles vary in length from _ inch-several inches. They are inserted in the appropriate parts of the body corresponding to the effected organ. The traditional acupuncture points, about 800 of them, are arranged along 14 lines, or meridians, running the length of the body from head to foot. The traditional Chinese explanation of the effectiveness of acupuncture is based on the Taoist philosophy according to which good health depends on free circulation of chi (qi) or life-force energy, throughout all the organs of the body. The chi depends upon a balance of the two opposing energies of yin (negative, dark, feminine) and yang (positive, bright, masculine). The meridians are the main channels of flow. When energy flow is impeded at any point because of a diseased organ or stress, illness in other organs may result. Piercing the channels at the proper points is believed to correct the imbalances. Acupuncture works by stimulating or repressing the autonomic nervous system in various ways; stimulation of the skin can affect internal organs by means of nerve reflex pathways. Acupuncture stimulates the release of natural pain-relieving chemicals, called endorphins as well as stimulates the pituitary gland, which in turn stimulates the adrenal gland to release anti-inflammatory chemicals.